For as long as Tutubi can remember, there's only one buko pie he craves for. He doesn't have a sweet tooth but the thought of buko pie from Los Baños, about an hour away from his hometown makes his mouth water. Orient The Original Buko Pie Bakeshop on the National Highway of Los Baños, Laguna churns out freshly baked buko pie that people passing by the place queue up just to buy them. If he remembers correctly, the brand Orient has only been added to the name to distinguish itself from other "original" buko pies peddled elsewhere, even by ambulant vendors, a "disease" that Tutubi refers to as "The Original Syndrome." Orient Original buko pie recipe simply uses tender buko slivers (young coconuts) and not the already mature ones. This is different from G&B buko pie of Tuao North, Nueva Vizcaya where milk and cheese is part of the buko pie recipe. 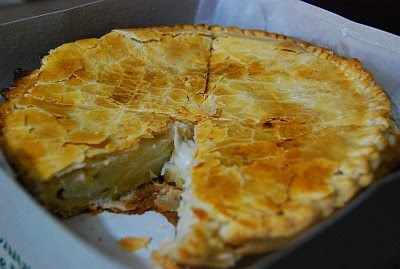 Note: The bakeshop doesn't sell Buko pie via ambulant vendors who board buses selling bootlegged "original" buko pies. Other pasalubong and delicacies in Laguna include espasol, puto binan (of Biñan town, do you know Nila's Puto Biñan? ), kesong puti (white cheese of Sta. Cruz made from carabao milk coagulated in vinegar, very similar to India's paneer but using lemon juice), minatamis na calamansi (sweetened Philippine lemon) in Pagsanjan, the obnoxious-smelling-yet-delectably-good bibingkang itlog similar yet less rotten-smelling than Pateros' bibingkang abnoy (mostly in Victoria town but peddled as fas as Paete), monay buns of Bay and minani and bibingkang galapong in Paete and Pakil. There are also vendors giving away free taste of their candies in buses, e.g. macapuno, espasol, ube et al, that you can buy at a cheap price of P10 per pack. University of the Philippines Los Baños (UPLB) with it picturesque campus, Homma-Yamashita Shrine (the execution site of Gen. Tomoyuki Yamashita and Gen. Masaharu Homma at the end of World War II), Dampalit Falls, Paciano Rizal Shrine, International Rice Research Institute (IRRI) and its Rice Museum, the original baths built by Spaniards (where the town got its name), and lastly, Mt. Makiling (Tutubi won't call it mystic mountain for almost all mountains in the Philippines are considered mystic by many people) with forest for trekking including mudflats. If you're specifically going to buy at The Original Buko Pie Bakeshop, you need to board a bus to Sta. Cruz that pass by Calamba and Los Baños. HM Transport Bus on EDSA Cubao (Southbound, near Victory Liner) or GreenStar bus on Taft Avenue (northbound) near corner Sen. Gil Puyat Avenue (walking distance from LRT Buendia station) and request the driver to drop you off there just before you reach Olivares Plaza and the place called College (going to the University of the Philippines Los Banos campus). Those buses don't pass by Alabang ilalim, you need to ride an HM Transit bus, usually non-airconditioned, to get there. If you're somewhere in Calamba hot spring resorts, you need to get to the highway to board Sta. Cruz-bound jeepneys to get there then board HM Transport bus going to Cubao or GreenStar Express bus to LRT/Taft after buying at the bakeshop. Commute from Rizal Province: it's better to board a jeepney going to Siniloan, transfer to a Sta. Cruz-bound jeepney at Siniloan public market, then ransfer again to a Calamba-bound jeepney. Alight in front of the bakeshop about a kilometer from Olivares Plaza mall. Commute from Quezon Province: board jumbo-jeepneys in Lucena or Lucban going to Sta. Cruz then transfer to a Calamba-bound Jeepney. Driving directions to Los Banos (follow this route to Los Banos): from Makati head towards SLEX and take Calamba exit (the last one) then pass over the bridge going to Calamba city proper. There is a diversion road that bypasses the traffic-prone Crossing where you pass by the new Calamba City Hall and RSM Lutong Bahay branch to exit in Halang but still you have to pass by Bucal and Barangay Pansol (where the hot spring resorts are located). If you missed the bypass road where many vehicles turn right, just drive straight then turn right at Calamba Crossing. You are now on the National Highway (that doesn't look like one). Continue driving until you see the sign on your left (and a portion of the highway where there are many cars parked). You won't reach Olivares Plaza, should you see the mall, you've passed the place and must turn back. for me just as long as the buko pie is full of buko then i'm fine with it =) there's one i particularly like which comes from this store that starts with the letter V. virgie's or venus yata yun. it's also in tagaytay. 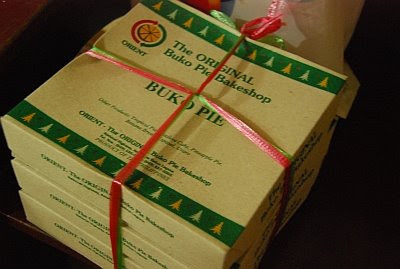 i've always wondered what store carries the original-original buko pie. "bootlegged original buko pies"...i like that phrase. hehe. Oh I would love a slice of that. I think I have tasted one in Tagaytay and they used the macapuno, but it's very very good too. Padala ka naman dito oh. puro colette's lang yata natikman kko dahil yun ang nagkalat sa kalsada. at least ngayon me hahanapin na akong ibang brand. pag-uwi ko, hu hu hu. that looks good and warm! mmmmmmmmmmmmmmm. how can i forget the buko pies of los banos or generally from laguna. i worked in laguna for three years and really enjoyed buko pies. I absolutely agree. The best ang buko pie jan and the trip is not complete without tasting one. Just to add, I don't know now but I have not successfully bought Orient buko pie when night comes even as early as 6PM. By that time all buko pies made for the day were already sold out so you have to buy them in the morning up to maybe late in the afternoon kung abutan mo pa. That's an assurance that you won't get any staled buko pie from them. Collettes lang yung alam ko eh. masarap din na pasalubong is mer-nels chocolate cake. mabibili siya sa grove, los banos. I'm from Los Baños, Laguna. I remember when I was a kid, my family would always ask me to get snack ("pa-merienda") for visiting friends/relatives and it would always be buko pie. To be honest I developed a dislike for it as a kid, we always have it and I grew tired of it. But now, having grown up and living outside the Philippines, I am nostalgic about those weekend afternoons where my grandmother would slice on the plump hearty pie (about 2-inches deep) steam coming out from the moist custard and the fresh almost crunchy coconut slices. Yummy!! I remember only 2 sellers during those days ('80s-90s) Mitz and Letty's. The latter having the popular sweeter crust. Their stores are along the Nat'l Highway at Anos (practically where I grew up). Letty's have a stall right in front of Carbern Village subdivision beside the Shell gasoline station. And Mitz would be right before the cemetery if coming from the north (Manila). All other brands are poor quality imitations often times leading to the detriment to my hometown's beloved food specialty. i want to eat buko pie!!!! please!!!! yes natikman ko rin once and since then nagpabalik balik nako sa los banos just to buy this pie. super to the max ang sarap!! meron p ba silang ibang branch? me also will recommend the original buko pie @ los baños. i've tried other brand of buko pie but original it's different. if i'm not mistaken sister company yata ng original buko pie ang letty's. i will be around in baguio or subic for this week? is there any nearby store selling buko pie? please send me message to choi_chat05@yahoo.com, appreciate your help thanks. 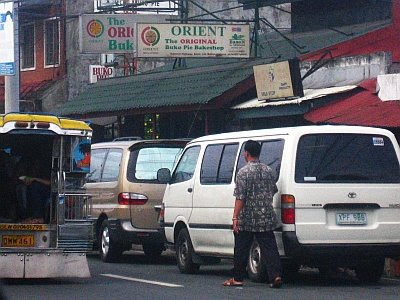 Orient talaga, ang may pinaka kalidad as for me, i'm from Pila Laguna, i grew up passing this place at Los banos, bakit ma-trafiic?-- dahil pala sa orient buko pie na pinipilahan.... huh sarap talaga..